SONIC BLOOM, the nation's premier boutique electronic music festival, is pleased to announce the initial lineup for their 10th annual festival. 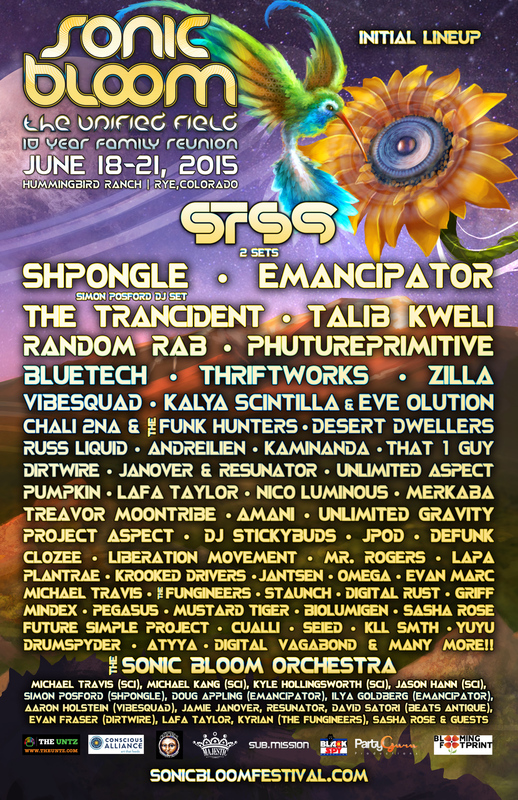 This year's headliners include STS9 (2 sets), Shpongle (Simon Posford DJ set), Emancipator, The Trancident, Talib Kweli, Random Rab, Phutureprimitive and many more. Celebrating their 10th annual festival, family reunion style, SONIC BLOOM will once again be held during the Summer Solstice the weekend of June 18-21, 2015, at a gorgeous new location: Hummingbird Ranch in Rye, Colorado. Unifying a cast of some of the world's most electrifying musicians, performers, visionaries and artists, SONIC BLOOM is an inspiring showcase of the best of Colorado's vibrant live and electronic music scene and is at the forefront of the transformative festival movement. SONIC BLOOM has been credited for helping to break the careers of Bassnectar, The Glitch Mob, Beats Antique, Big Gigantic and Pretty Lights as it is known for discovering and hosting the most progressive electronic innovators and live electronic acts with styles that span the electronic music spectrum: from the highly celebrated to the relatively unknown. SONIC BLOOM has also just announced The Unified Field, the official SONIC BLOOM pre-party, a 2-night dual-venue indoor minifest that will happen in Denver, CO, on April 24 & 25 at Cervantes' Masterpiece Ballroom & The Other Side. This year's artists include Thriftworks, Dirtwire ft. David Satori from Beats Antique, Andreilien, That 1 Guy, Fort Knox Five and more. Limited advance early-bloomer pre-sales for The Unified Field are now on sale for only $30 (while they last). 4-Day General Passes include entry into the festival on Thursday, free on-site camping and free drinking water. VIP 4-Day Passes, parking passes, limited car camping passes and RV passes are also now on sale. For more information on SONIC BLOOM, please visit the official website: www.sonicbloomfestival.com. Sonic Bloom 2014 Recap from LUCID TV on Vimeo.